On the edit page of your quiz, in the integrations section, flip the switch below the MadMimi icon and select the list(s) you want to send the leads to. We also support Segmentation, which allows you to send the leads to differents according to rules you defined. 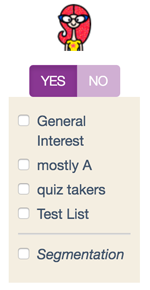 From then on, all leads collected in your quiz will be sent directly to the list(s) you selected. If you have never heard of it: MadMimi is the easiest way to create, send, share and track email newsletters online. MadMimi is for people who want email marketing to be simple. Every day, over 40 million emails are sent, shared and tracked using our delightful and powerful service.